More than a month after winning the Miss Earth 2016 crown in the Philippines, Katherine Espin is back in Ecuador. The 23-year-old beauty was welcomed in grand fashion when she arrived in Guayaquil airport yesterday, December 7. “I never imagined this reception,” Espin was quoted by El Comercio, referring to the loud cheers and warm welcome she was given by friends, family and supporters. 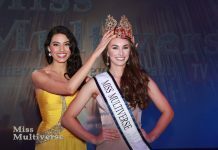 Previous articleMiss Germany and Miss Earth – will it open a new era for Europe?